Dive into a female-friendly tour through the beautiful country of Italy. In her new book 100 Places in Italy Every Woman Should Go, travel writer Susan Van Allen expertly guides travelers through the creation of their perfect Italian getaway, reminding readers of the country’s feminine soul as a place where Venus reigns side-by-side with Madonna. Since Italy is a favorite destination for many female travelers, Van Allen has created a guide to the overwhelming amount of information. The book is organized by vacation type and provides women with secret tid-bits about where to find great shopping, the best beaches and the tastiest food. 100 Places In Italy Every Woman Should Go inspires women to explore Italy and take advantage of all the country has to offer. 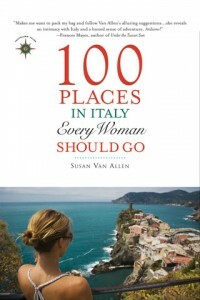 100 Places In Italy Every Woman Should Go is now available in bookstores and online. A Kindle version of the book is available for purchase as well. Plus an iPhone application download of the book is available on ITunes!